Slow Food and Terra Madre videos shared at the Salone del Gusto Internazionale and Terra Madre Event in Torino highlight the opportunity to connect family farmers, local chefs and regional cuisine with the rest of the world. 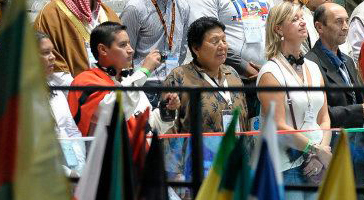 Edwin Viña, a young chef from Tarija, Bolivia (left), had the honor of carrying his country's flag into the event. Edwin is taking part in the Paths of Excellence Program. The young entrepreneur represents Tarija Aromas y Sabores, a public-private initiative designed to promote the rich gastronomic offerings from the Tarija region - including agro-tourism, hams, cheeses, wines and Bolivia's signature grape brandy Singani. The Tarija Aromas y Sabores Program is part of a program supported by Discovering Territories through Products and People Program, Rimisp, the IFAD-supported Scaling-up of Rural Innovations Program that is working in Bolivia and Peru, IDRC-Canada and the Ford Foundation.